The Department of Agriculture announced the recall of breaded chicken. camera (AP) In this Wednesday, Oct. 28, 2009, file photo, a Tyson Foods, Inc., truck is parked at a food warehouse in Little Rock, Ark. The U.S. Department of Agriculture’s Food Safety and Inspection Service (FSIS) announced Friday the chicken may be contaminated by pieces of "blue and clear soft plastic." The chicken was sold in 3-pound plastic bags of “UNCOOKED, BREADED, ORIGINAL CHICKEN TENDERLOINS,” with a lot code of 1378NLR02, the USDA said. There have not been any reports of injury or illness. The FSIS said some of the chicken could be stored at food service institutions, as opposed to homes, and urged the locations not to serve the chicken. The plastic pieces were discovered on Friday in breading ingredients, according to the USDA, and the FSIS was immediately notified of the problem. The recall on Friday is much smaller than one issued by Tyson Foods almost exactly one year ago. 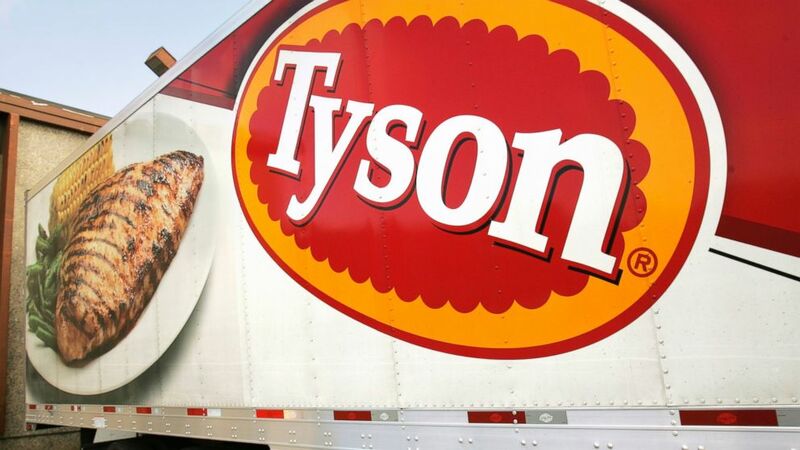 On June 9, 2017, Tyson recalled just shy of 2.5 million pounds of ready-to-eat breaded chicken "due to misbranding and undeclared allergens," the USDA said.